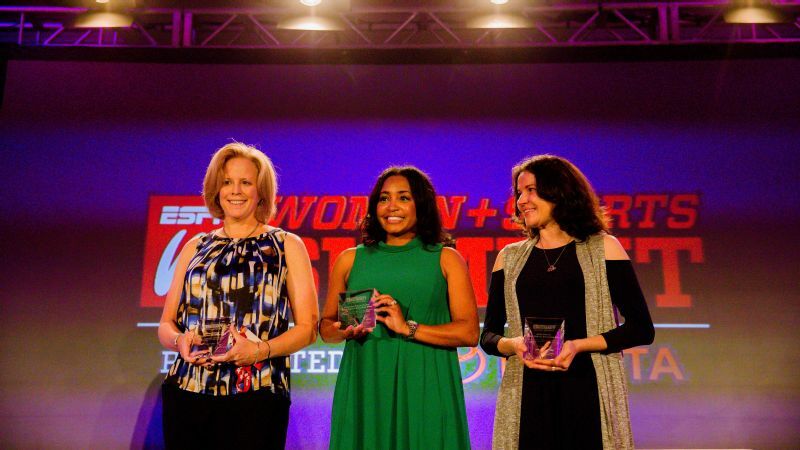 Launched at the 2013 espnW: Women + Sports Summit, Toyota's Everyday Heroes program honors women who are working to promote and grow sports for girls and women in their local communities. 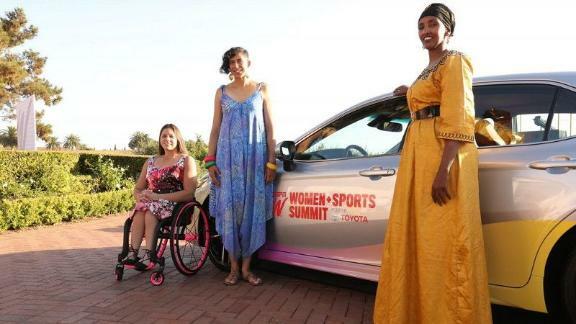 Meet the 2017 Toyota Everyday Heroes: Darlene Hunter, Fartun Osman and Mira Manickam. 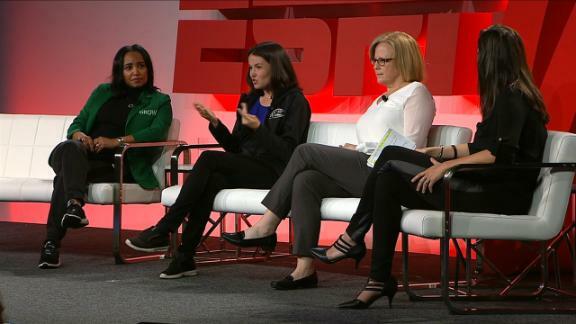 Launched at the 2013 espnW: Women + Sports Summit, the Toyota Everyday Heroes program honors women who are working to promote and grow sports for girls and women in their local communities. Hunter, a 2016 Paralympic gold medalist, runs the Arlington, Texas-based Lady Mavericks Wheelchair Basketball team. The overarching mission is to empower disabled girls and women through basketball, showing them that they can be strong, successful and independent while advocating for themselves. Hunter leads the team, runs its fundraising and camps, and is also a player. In the long term, the Lady Mavericks would like to expand their camps and the number of participants so they can continue to make a difference in the lives of disabled girls and women. In general, Somalian girls are not encouraged to play sports. The expectation is for them to get married, have children and take care of their families. Fartun Osman, a former world-class basketball player on the Somali national team and now an assistant coach, knew these girls wanted and deserved to play. After fleeing her homeland in the late 1990s and settling in Minnesota, she set her sights on creating change. In 2004, Osman founded Somali Girls Rock, an organization that provides girls and women the opportunity to participate in soccer, basketball, and track and field in an environment where they're comfortable. The programs encourage the budding athletes to wear their hijabs without questions, admit when their family can't afford food, and console one another when parents don't show up to games. The program directly services Minnesota's sizable Somalian community, with about 1,000 girls and women (8-24 years old) having come through her program throughout the years. Some SGR graduates have gone on to play in college while others have become doctors, lawyers and community leaders. For the most part, Osman has managed to cover costs through community donations and awards. However, the organization struggles to cover basic operating expenses. Manickam launched Brown Girl Surf in 2014 in an effort to make surf culture a more inclusive space for women of color. The Oakland-based organization is open to girls and women ages 9-99, increasing access to surfing and helping the participants build a connection to the ocean and nature. Manickam and crew serve about 120 people per year, with sliding scale fees, scholarships and participants from across the socioeconomic spectrum. Going forward, BGS wants participants to go on outings on their own, making them the leaders in the surf community. Fundraising for the organization is done through grants and a base of individual donors. Payne-Taylor founded Girls Riders Organization (GRO), a non-profit open to all females in skateboarding, snowboarding and other action sports. Skateboarding helped Payne-Taylor turn her own life around, and she wanted to share the sport as more than just an activity but also as a platform for life lessons. GRO's mission is to inspire, educate and support girls through action sports to be active in life and confident leaders of positive change in the community around them. Crews are comprised of five or more GRO Riders promoting the organization's mission in their community. Through GRO Crews, girls learn how to work together to plan and execute female action sports events and initiatives to increase accessibility and opportunities for girls locally. GRO Crews currently exist in Fremont, California; New York City; Richmond, Virginia; Royal Oak, Michigan; Windsor, Ontario; Los Angeles and Colorado. GRO hosted three "Ladies Day" events for snow and 23 skate sessions in 2016. GRO is a volunteer-based organization. Annual membership is $40, but no girl will be denied membership for financial reasons. The organization's goal is to have a GRO Crew in every state. Pointer is the founder of GROW (Golfers Recognizing Opportunities for Women, Inc.) and GROW Girl, organizations in the Nashville, Tennessee area that help teach multicultural women and girls the rules and etiquette of golf and how to use golf to approach life lessons and pursue their dreams. Pointer started GROW in 2007 with a mission to foster personal and professional development opportunities for multi-cultural women through a mutual interest in golf. She also started GROW Girls, in which GROW members serve as mentors, exposing girls to members' careers and introducing them to golf. GROW sees golf as untapped scholarship potential, especially in urban areas, to allow women to further their education. The organization holds four to five sessions during the summer, exposing about 15 girls to golf. All funds from their annual tournament benefit the GROW Girl program, which makes the program free to girls. Pointer's goal is to create a Girl Scout patch centered around golf so she can reach more young girls across the country. There are plans to start affiliates in other geographical areas. Devine, a swimmer, runner and triathlete, left the corporate world to get back to working with kids and founded Philly Girls in Motion, a nonprofit offering fitness and nutrition programs for girls through recreation centers and select schools in Philadelphia. The program, started in 2010, engages girls in fitness activities, sports and education and also encourages and teaches girls healthy habits. The goal is to get girls moving and to teach them and their families about healthy nutrition, exercise and positive body image. Fitness programs, as well as basketball, volleyball, lacrosse, rugby and yoga, are offered through the organization. The program serves more than 500 girls in second through eighth grade each year. Philly Girls in Motion partners with the Children's Hospital of Philadelphia's Healthy Weight Program. Boynton is the executive director and co-founder of the Mini Mermaid Running Club for girls ranging from 5 to 15 years old. The mission of the club is to help build self-esteem, teach healthy eating and living skills, while giving girls a chance to fall in love with running, moving their bodies and experiencing the satisfaction of crossing a finish line. The club wants to provide all girls with strategies to combat feelings of insecurity and tools to build self-esteem, thus empowering them to make better choices in the future. The organization is changing the lives of girls and young women by shifting their internal experience and the way they interact with the world around them. Mini Mermaid Running Club participants train for a local 5K through a structured program that meets biweekly for six weeks. Mini Mermaid has programs in 13 states and nine countries, and in just over six years of programming, more than 5,200 girls have participated in the six-week curriculum. Boynton has competed in more than 25 triathlons, multiple marathons and ultimately completed Ironman distance triathlons. She has twice been diagnosed with cancer, in 2001 and 2008, and has made a commitment to empowering women and girls worldwide through endurance coaching, speaking, writing and service work. Boynton has two sons and lives in Santa Cruz, California. In 2010, Summers founded Beyond Sticks, a field hockey organization that brings an integrative approach to leadership and confidence, alongside technical game instruction. Today, there are 650 girls enrolled in their camps, academies, partner club and league annually. What makes Beyond Sticks stand out is the focus on empowering student-athletes to become leaders through sport. The Beyond Sticks staff focuses on training young women how to achieve a high skill level and technical knowledge of the game, but also believes success comes when athletes are able to translate these skills into other areas of life, and does so through our Play Beyond the Game curriculum. The non-profit arm of the organization created a recreational league for girls called the Loudon County League, which consists of around 250 girls. A group of concerned parents and Summers started the league because varsity level field hockey wasn't offered for high school girls in Loudoun County (Virginia). The league is held in the fall and the spring, and girls are coached by parent volunteers. The league is supported through fundraisers and donations, and typically 10 girls receive scholarships. The league also has successfully lobbied for 16 high schools in Loudoun County to adopt field hockey. In April of 2016, the school board will vote on whether it will continue to fund the program, or if the non-profit will have to raise funding on its own. Summers gave birth to her first child last September after spending four years coaching high school varsity field hockey. A former collegiate player at Vassar, Summers was a four-time NCAA All-Academic honors recipient, captained her junior and senior years and received All-Conference honors in her final season. Summers lives in New York, where her husband is on active duty. Summers is a volunteer coach at Columbia University. A public health professional and former academician, Dr. Kimberly Clay, of Nashville, Tennessee, is the founder and executive director of Play Like a Girl -- a resource to inspire girls to live a happier, healthier and more active lifestyle by promoting physical activity. Her research, which explores the relationship between cancer, survivorship and spirituality, has been cited in Journal of Psychosocial Oncology, Journal of Religion & Spirituality in Social Work, Health Education Research and Cancer Control. She serves on multiple community organizations including YWCA of Middle Tennessee and Junior League of Nashville, among many others. ESPN soccer commentator and former professional player Mónica González is the founder of Gonzo Soccer, a not-for-profit soccer and leadership academy for girls ages 8 through 16 from Chicago's underserved communities. The former All-American and Academic All-American at Notre Dame was a founding member in 1998 of the Mexican women's national team, helping lead it in the 1999 FIFA Women's World Cup and serving as its captain from 2003 to 2007. González, a native of Richardson, Texas, played two with the Boston Breakers, earning 2003 WUSA All-Star honors. Smallwood is the executive director of SheJumps, a nonprofit whose mission is to increase female participation in outdoor activities. She holds a BA from Lewis & Clark College in Foreign Languages and Literatures. "What inspires me about my work with SheJumps is the chance to create opportunities for women and children who would normally have none," she says, "and to plant the idea that it is possible to live an adventurous and inspiring lifestyle, no matter who you are or where you come from." Akiode grew up playing basketball and graduated as Fordham's sixth all-time leading scorer. After graduating from college, she played professional basketball in Europe and for the Nigerian national team. It was that time with Nigeria that sparked Akiode's dream to build the Hope 4 Girls foundation, which focuses on instilling discipline, developing leadership skills, promoting pro-social friendships and reasserting a sense of hope in the future amongst girls from less privileged backgrounds. Since its launch in March 2010, Hope 4 Girls has opened its doors to girls from Ghana and Benin Republic and helped girls secure student athletic scholarships. Lazarus, who was a four-sport athlete in high school, has dedicated the past eight years to creating opportunities for girls in Chicago through Game On! Sports Camps 4 Girls, program that holds summer camps that help empower girls (ages 4-14) to develop or enhance their passion for sports. In addition to the camps, Lazarus also created the Game On! Foundation, which raises funds to help young girls gain more opportunities through sports. Siegal, a pioneer in the baseball community, was the first woman to throw batting practice for an MLB team and coach a men's pro team. Using her milestones as inspiration, Siegal founded Baseball For All, a program that provides meaningful opportunities in baseball, especially for girls.